As you all know, the liturgical color for Lent is a dark purple. The color for Easter is white. If you mix those colors together, you get a pinkish color—which is the liturgical color for today. That means the priest and deacon can wear rose today. I’m thankful I don’t own such a vestment…I don’t do pink well. But the reason for the option is that today is Laetare Sunday—Rejoice Sunday—and every year this day falls halfway through Lent. It’s the Church’s way of saying, Lent is almost over. You’re halfway there. Hang in there and lighten up. As a way of celebrating this Rejoice Sunday, Catholics used to cook up a special fruitcake recipe called the Laetare Fruitcake. It was a way of taking a break from our Lenten fasts and penances. I hate fruitcake. For me, to eat it would be the more penitential thing. Let’s look to our readings to see what this triple A business is all about. In the first reading, everyone had forgotten about David. He was off on his own, all alone. All his brothers were lined up in the line of potential future kings, but David had been forgotten about, neglected, abandoned. He was shepherding the flocks, a job too dirty and too low for his brothers. No one wanted much to do with David. But when everyone else had forgotten about him, God did not forget about him. When everyone else left him alone, God would not leave him alone. He was there with David, and so when the line of candidates for the job of king is assembled, God tells Samuel: Someone is missing, go get my David from the hills. He is the one I want. God accompanied David when no one else would. And then God anointed David king. No one thought he’d be the new king. He was too young, too untalented, too fragile. He didn’t have the gifts of his brothers, lacked their skillsets. But God chose him anyway, and the reading ends with oil being smeared upon him as he is anointed king. And then God amazed David. David didn’t know the strength he had. He and his people were amazed that he seemed to be doing a decent job, and though he made mistakes (even some big ones), he was a pretty good king, a king better than what they’d seen in some time: he was merciful, he was humble, and he feared God. He goes down in the books as one of the best kings in the Old Testament. God accompanied David, anointed David, and amazed David. The same pattern is even more evident in the Gospel. There we find the man born blind, a man who suffered not only the affliction of not being able to see, but a man who was ostracized because of it (for everyone thought his blindness was a punishment for being some big sinner). He was alone, by himself when Jesus came up to him and accompanied him. And then Jesus took some dirt and his spit and anointed the blind man’s eyes. He anointed them—that’s scripture. And suddenly the man who couldn’t see for 25 years could see. Can you imagine how amazed he was? When he saw the blue sky, the sunset…the face of his son for the first time. I bet his eyes flowed with tears of thanks and wonder and amazement. 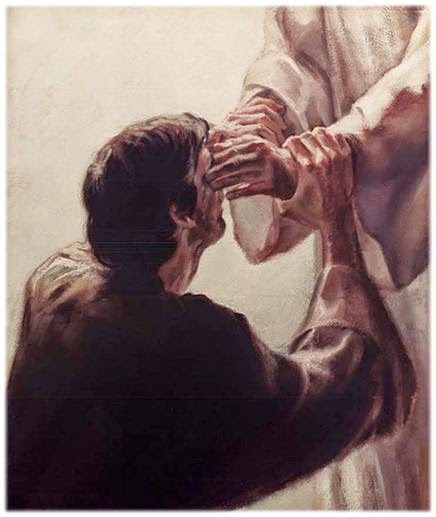 God accompanied that blind man, anointed him, and then amazed him. Scripture scholars say that the first reading about David and the Gospel about the blind man are both about baptism. And that’s what the second reading is explicitly about today: baptism. The Ephesians had been pagans, they did not believe in anything. And yet even before they believed in God, God was accompanying them. And then God anointed them—with the same oils we use in baptisms today. And they were utterly amazed, their lives were changed forever. Today we are blessed at this parish to have several catechumens who are preparing for baptism in a few weeks. They are preparing for that moment when they, too, will share in the Ephesians’ joy. We pray for them! God accompanied those Ephesians, anointed them, and then amazed them. What about us today? I think God does the same triple A in our lives today. He accompanies us, even when we are in the hills like David, having been forgotten about by everyone else. And he accompanies us in our doubts and questions and frustrations that we have towards God, just as he was with those Ephesians even before their baptism. And God accompanies us as he accompanied the blind man—he’s with us in our afflictions, our blindnesses, our illnesses and darknesses. God is not afraid of our darkness, our poverties and failures. He comes and sits next to us. And God anoints us, just as he anointed the blind man so that he could see, just as he anointed the lowly David, just as he anointed the Ephesians. God splashes oil upon us at baptism and confirmation and on our sickbeds, but he also anoints us, blesses us in everyday kind of ways: with a hug or smile at just the right moment. He blesses us when we get a phone call or a nice note out of the blue. He blesses us, anoints us with a beautiful day (like today) or with a child’s embrace. God anoints us, blesses us all the time. And after every blessing, every anointing—God amazes us! When I visit folks in the hospital nearing death, after the oils are poured upon them and prayers of the church are said, I sometimes tell them to relax, that they are about to be amazed when they enter Glory. “Eye has not seen, ear has not heard what God has ready for you,” I tell them. And it’s true! God wants to amaze our socks off! He wants to amaze us extravagantly, just as he did for David and the Ephesians and the blind man! And love, so long denied me. We have a God who always accompanies us, always anoints us, and always amazes us. I’d say we have a lot to rejoice about on this Laetare Sunday. This entry was posted in Homilies, Lent. Bookmark the permalink.